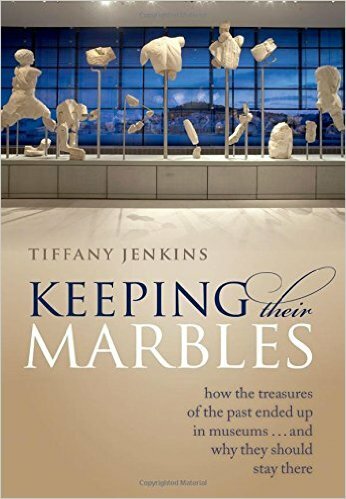 In Keeping Their Marbles, Tiffany Jenkins [...] investigates why repatriation claims have soared in recent decades and demonstrates how it is the guilt and insecurity of the museums themselves that have stoked the demands for return. Contrary to the arguments of campaigners, she shows that sending artefacts back will not achieve the desired social change nor repair the wounds of history. Instead, this ground-breaking book makes the case for museums as centres of knowledge, demonstrating that no object has a single home and no one culture owns culture. The question of how best to protect the world's cultural heritage, and what role museums, nations states, and international bodies play in doing so, or in not doing so, is a vexed one. And in the time of IS, it is an urgent one. Tiffany Jenkins sets out a clear, compelling, and at times controversial case for, and sometimes against, museums as repositories and interpreters of the past in a time of nation building. She argues that we are asking too much of our museums, that we want them to serve narrow ideological purposes of cultural and political identity. There is much to agree with in this argument, and of course, much with which to disagree. That's what makes this book a must-read.